If there's one formula of lip product that I'm known to criticise, it's those pesky Liquid Suedes by NYX. The line-up is stunning - NYX have always been fairly well ahead in producing bold and unique shades in the drugstore, and the Liquid Suedes collection is no exception. There are sky-blues, a deep black, varying shades of purple and, my personal favourite, Stone Fox, a totally unique greenish bluish grey. It's unlike anything else I've ever seen before, and the colour stole my heart from the get-go. The downside? I find the Liquid Suede formula moves like nobody's business. It slips, it slides, it gets on my teeth and I end up with lipstick smears on my face when my hair gets stuck in it. I've spent a lot of time searching for an alternative, but the closest I've found so far is an offering from LA Splash, whose liquid lipstick formula I do not have a good history with (very dry, very crumbly). Then, I had some hope. 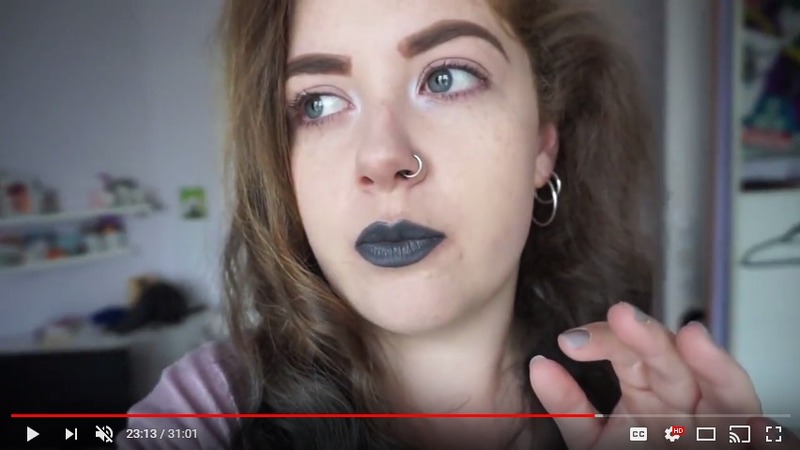 NYX were launching lip liners to compliment a ton of their lip products - including their Liquid Suedes, so I made an order from ASOS of the Stone Fox lip liner thinking my life was complete - I'm no stranger to wearing a good lip liner on its own. Unfortunately the pencil is very dry and drags a lot, and whilst that may make for some good staying power, it just wasn't very flattering to see the slightest, smallest dry patch of my natural lips peeking through the grey colour. So then I decided to try adding something on top, and that something is the gorgeous NYX Matte Lipstick in the shade Haze - another product I nabbed from ASOS in that same order. Whilst I find the Matte Lipstick range to be somewhat drying, it seemed to be the antidote, the fix, to the Sahara Desert-like feel that struck my lips when loaded up with the Stone Fox pencil. The result? A much more wearable formula that still has those unique Stone Fox vibes. While I'd still love a matte liquid lip version/dupe, I think this does a pretty similar job and also looks rad af. What do you think of the Stone Fox shade?